The expansion of natural gas infrastructure along the East Coast has created a seemingly endless queue of new pipeline battles involving landowners, environmentalists, states and the federal government. Some of the proposed pipelines have similar names. A handful have similar routes. Many have been in the news for years, while others seem to have sprung from nowhere. They're all accompanied by a nonstop stream of procedural and legal drama. Even the most astute pipeline watchers have trouble keeping it all straight. Was it Atlantic Coast or Atlantic Sunrise that just got approved? Wait, how many projects are on hold in New York? And aren't there nuns protesting somewhere? Here's a breakdown of some of the most interesting projects to help you avoid getting your wires — er, pipelines — crossed. The fate of this project might not just be a matter of laws and regulations; it may also be a battle of political wills. Democratic Gov. Andrew Cuomo of New York has held up a number of high-profile gas projects, including the Constitution pipeline. For its part, Williams Cos. Inc., the lead sponsor of the project, is banking on favorable treatment by the Federal Energy Regulatory Commission. It all began early last year, when New York regulators denied Constitution a water permit required by the Clean Water Act. Williams challenged that decision in the 2nd U.S. Circuit Court of Appeals. The court let New York's decision stand, but it declined to rule on a critical issue Williams had asked about: whether New York had ceded that authority to the feds by taking too long to review the project. Now Williams is asking FERC to find "waiver" so that it can start construction on the nearly $700 million project. CEO Alan Armstrong has said the company is pressing FERC and the Trump administration to overrule New York, and lobbying records confirm that representatives for Williams have held meetings with the White House and federal agencies. For now, Williams doesn't see the pipeline going online before 2019. "Plenty of fight left in this dog, and I think we're well-positioned for it," Armstrong told analysts this month. "But we've got — we will have a fight on our hands, I suspect." National Fuel Gas Co., the lead sponsor of the Northern Access project, launched a bevy of legal challenges after New York regulators denied its water permit this year. But even the company's president and CEO, Ronald Tanski, has conceded that "it's anyone's guess when we might get an answer." The roughly half-billion-dollar project would beef up the pipelines and other infrastructure that send gas across the Pennsylvania border into the Buffalo area. It had approvals from FERC and Pennsylvania regulators, but the April decision by the New York State Department of Environmental Conservation left it one permit shy. National Fuel Gas is challenging New York's denial in the 2nd Circuit, and it's also asking FERC to declare state authority "waived." But as Tanski has acknowledged to investors, some of the pivotal legal questions are getting worked out in other cases, such as the Valley Lateral project in New York. Northern Access has no official service date. 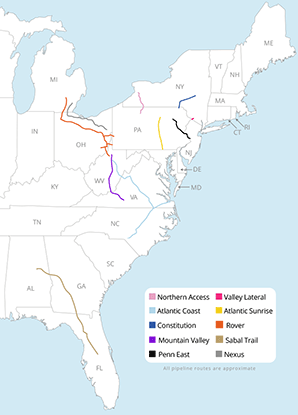 Route: Connects Millennium Pipeline Co.'s main line to a power plant in Orange County, N.Y.
What could have been a routine approval for a $39 million fuel line to a power plant has evolved into a high-stakes case with a federalist twist. The brouhaha began in August, when the New York State Department of Environmental Conservation denied a water permit that Millennium had to get under the Clean Water Act. Millennium protested to FERC, saying New York had taken longer to reach that decision than the statute allowed: a year. FERC agreed, saying New York had waived its authority to do the review and that Millennium could go ahead. Not so fast, the 2nd U.S. Circuit Court of Appeals said. New York has argued to the federal court that it was within its one-year period when it denied Valley Lateral in August. It simply disagrees with the company on when it got a complete application. And it thinks states' interpretations on this issue trump Washington's. Now New York, FERC and Millennium will meet in the 2nd Circuit to debate this little piece of the Clean Water Act. They'll attempt to resolve a question that will be significant for other interstate gas pipeline projects. First proposed in 2014, the roughly billion-dollar project would connect gas fields in the Marcellus Shale to New Jersey, a state that gets more power from gas than any other fuel. But the project hit a speed bump in June when state regulators under Republican Gov. Chris Christie blocked the project's application for a water certificate required under federal law. PennEast says it's preparing to reapply, but the delay could be costly. Democrat Phil Murphy won convincingly in this month's gubernatorial election, and he enters office with Democratic majorities in the statehouse and ambitious plans for renewable energy. If Murphy sets up anti-pipeline leadership at the state Department of Environmental Protection, New Jersey could become the next front in the pipeline wars. But if his union supporters convince him otherwise, Murphy could just as soon let the project proceed. He takes office in January. Atlantic Sunrise encompasses new construction in Pennsylvania and an array of upgrades along the existing Transcontinental Gas Pipe Line Co. LLC system that runs down the Eastern Seaboard to the Gulf Coast. The $3 billion project has attracted the most pushback in Pennsylvania, where landowners, environmentalists and a group of Catholic nuns have led opposition. The Adorers of the Blood of Christ sued FERC over its approval of the pipeline, arguing that routing the line across their land violates their religious rights. A district court dismissed their claim, and it's now on appeal. Environmentalists have raised various other challenges to the project, including whether Pennsylvania regulators properly considered its impacts and whether FERC acted beyond its authority when it issued orders related to the pipeline without a quorum. Atlantic Sunrise opponents had brief success earlier this month, securing a construction freeze. The victory was short-lived, however, and the freeze lasted only two days. The other challenges are pending, and additional lawsuits are expected. The $2 billion Nexus pipeline in Ohio has been a hotbed of legal challenges since before it was approved. Landowners filed a novel lawsuit in May, arguing that FERC's practice of granting eminent domain authority to pipeline developers is unconstitutional. That case is still pending in federal court in Ohio. Nexus has also spurred a challenge to a longtime FERC practice of issuing "tolling orders" that extend the agency's deadline for responding to rehearing requests. That lawsuit has been sidelined for now, but environmentalists will likely raise the issue again. The $4.2 billion Rover project to move up to 3.25 billion cubic feet of gas from Mid-Atlantic shale plays is being developed by Energy Transfer Partners LP, the company behind the heavily protested Dakota Access oil pipeline. The project had problems with drilling fluid leaks and other environmental issues in Ohio almost as soon as construction started this spring, and the state of Ohio is suing Energy Transfer Partners on charges that it violated state air and water protection laws. West Virginia regulators also briefly stopped construction on the project, and Energy Transfer Partners is operating under construction limitations from FERC. FERC also has an ongoing investigation into whether the company used unapproved ingredients in its drilling fluid mix. In 2015, Energy Transfer Partners purchased a historic home near the pipeline route with assurances that it would be protected, but instead demolished it. FERC and Ohio state agencies negotiated a settlement for potential violation of the National Historic Preservation Act, and the company paid a portion of the agreed fine but has indicated it will not pay the balance. 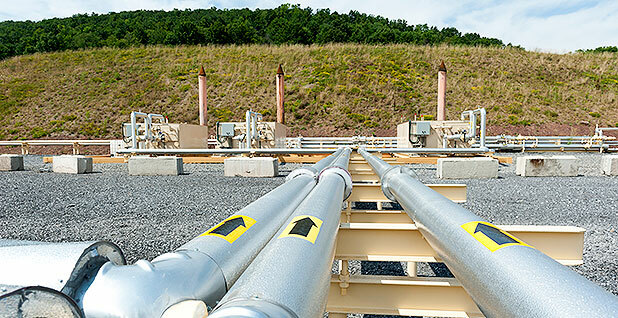 The $3.5 billion Mountain Valley project is being developed by Pittsburgh-based EQT Corp. and partners to carry shale gas from West Virginia to markets in Virginia. The project has been controversial in Virginia, with pushback from environmentalists and landowner groups, and is the subject of a legal challenge that says the use of eminent domain for the pipeline violates landowners' constitutional rights and the Natural Gas Act. The project is also notable for an unusual situation in West Virginia, where developers first secured state water permits only to see them withdrawn by the state Department of Environmental Protection in response to charges that the state's review was inadequate. State officials initially said they intended to review the permits but instead opted to waive their right to regulate the project's water quality impacts, a decision that shifts the responsibility onto the Army Corps of Engineers. When the pipeline was approved by FERC, it received a split vote, with one of the three voting commissioners dissenting on the grounds that the project was similar to the Atlantic Coast project and could potentially be combined with it to reduce their combined environmental impacts. Atlantic Coast is a $5.1 billion project developed by four energy companies — Dominion Resources Inc., Duke Energy Corp., Piedmont Natural Gas Co. Inc. and Southern Company Gas — to deliver Mid-Atlantic shale gas to local markets in Virginia and North Carolina. It has faced strong local opposition in both states and was a point of debate in a fierce governor's race in Virginia. Democrat Ralph Northam, who largely dodged taking a position on the project but once supported it, won that race. The Atlantic Coast project and another pipeline with a similar route, Mountain Valley, were approved by FERC in October. The decision triggered a rare dissenting opinion from one of the three sitting commissioners, who said the two projects were largely similar and could potentially be combined to minimize their collective environmental impacts. Atlantic Coast is also the subject of some legal challenges over the use of eminent domain authority. Another controversy: The pipeline is slated to end 12 miles short of the South Carolina border, but there is speculation — fueled by October remarks by a Dominion Energy Inc. executive — that the developers want to extend it farther. Sabal Trail is most notable for sparking a legal battle that forced FERC to take a closer look at the project's climate change impacts. The $3.2 billion pipeline, part of the broader Southeast Market Pipelines Project, sends gas to power plants in Florida. According to the U.S. Court of Appeals for the District of Columbia Circuit, FERC is required to estimate the greenhouse gas emissions from burning the gas. The August decision was the D.C. Circuit's most forceful decision to date requiring more climate analysis for pipelines. Now, environmentalists are urging the D.C. Circuit to halt pipeline operations until FERC completes additional review. The agency is working to comply with the court order in a hurry. It issued a draft analysis in September, but critics say it's not enough.